It’s been a year (and a day) since I first began my blogging adventure. A year ago I had just graduated from college, had just made the move to Middle-of-Corn, Kansas, my job title was associate editor and I was very much happily single. In a year, I’ve settled into Middle-of-Corn, made some awesome friends, my title was changed to editor, there was that two weeks as a vegan, traveled a lot and I’m very much happily engaged. Looking at my stats today, I figured my top posts throughout the year would be something like Dani B. Home Security or Monday’s post, since, when I hear back from people, the personal posts are usually the favorite, BUT I was wrong… It turns out of the top five, three are Ag posts and two are vegan posts. 4. Can I pet your cow? Or not, whatever you prefer. This dragging it out business is fun! 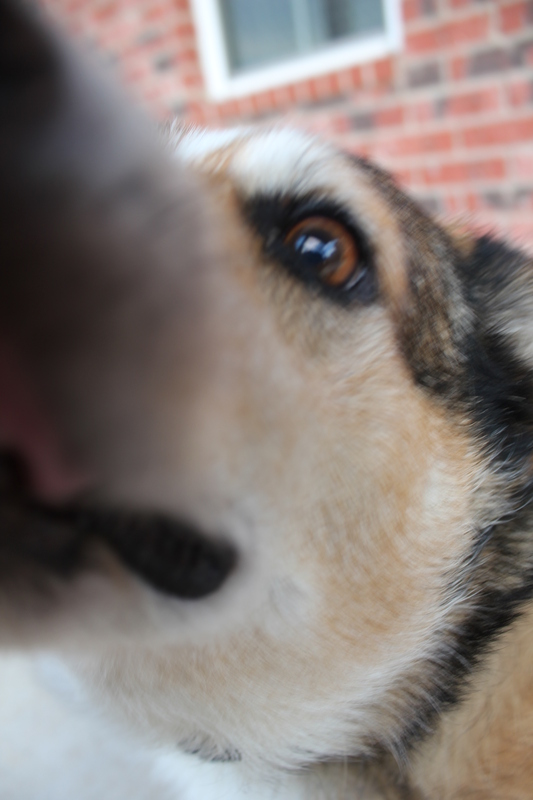 Here’s a picture of a Corgi licking a camera lens. Okay, fine. I can feel the glares coming through the computer screen. Let’s ignore the fact that as I typed that, this was currently not published. Erica, my email is on the Cajun Born, Okie Raised page so give me a shout and I’ll get it sent your way, and thank you to Cowgirl Crush for sponsoring this giveaway! As I said before, when I started this — blogging — it was just for myself, just a way to document what was happening in my life. I didn’t picture people outside my family and close friends to actually read High Heels and Shotgun Shells, but I’ve met some really awesome people because of this, really, you all are truly fantastic. So here we go, onto year two… there’s going to be a wedding, a move across several states, My Someone is going to have to fork over that closet of his that’s designated for hunting apparel only — my shoes need space (lots of space), yo. Oh, and I’ve got to find another job as fantastic as the one I currently have. Whewww…thanks for posting who won!! I was on pins and needles! 🙂 I’m sure Laurie was too! Congrats on 1 year – you have great things in store – I’m sure of it!!! Congratulations on your blogiversary and my best as you begin Year 2! I visited your Blog as part of the Little Bird’s Dad Blog-About 2013. I love the design of your page – clean, bright, and makes me want to hang out and read! Good Job!! I’ll be linking to this page in an upcoming Blogabout Diary entry. I must have missed it in your previous posts (or forgot, ha) which state are you moving to? Iowa? Hehe:) Also congrats on one year of blogging! Lol I’m moving to Kentucky, and thank you!